I don’t climb ladders very gracefully, as Valter Desfassiaux knows—he’s seen it firsthand. Valter is a stylist and makeup artist at Barbara and Barbara, a salon in Logan Square in Chicago. We chatted in the salon’s back room, on what looks like an indoor balcony. Accessible only by ladder, it’s where the previous owner kept his loft bed. The quirky, lived-in vibe of the back room permeates the rest of the salon. A sign on the wall reads “God Bless Our Trailer,” and while clients wait, they can lounge on a sofa sipping free PBR. “We wanted it to feel like you were just hanging out in someone’s apartment,” Valter says. Of course, most apartments don’t have a massive mural of a purple-haired forest in their living room. 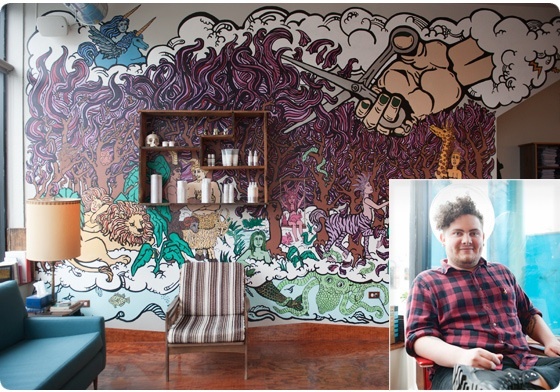 Created by local artist Cheri Charlton, the salon’s mural depicts a muscular hand descending from the sky and shearing the trees’ foliage, whose snipped ends shower a community of centaurs, mermaids, and giraffes. In real life, the only thing that descends from the sky at Barbara and Barbara are the blow dryers, which plug into the ceiling; but the epic painting does feel appropriate in the space, where the cuts and color jobs are at once edgy and laid-back. “People don’t use [conditioner] as much as they should,” Valter says. And when they do use it, they often apply it incorrectly. He recommends smoothing it on from mid-strand to ends, leaving the scalp to its own devices; it produces all the oil it needs. As far as choosing a product, Valter loves the eco-friendly conditioners at Lush. They smell like candy, and are made from all-vegetarian ingredients—mostly organic produce and essential oils. “Frizz is going to happen,” Valter says. “The question is how [to] control it.” A good cut is key, as is never drying your hair with a towel—instead, he recommends an old T-shirt or a rag. (Paper towels also work, but “it’s not really earth friendly.”) For anti-frizz products, he recommends Moroccanoil, since the formula works on both wet and dry hair. It’s counterintuitive, but Valter recommends a trim every four to six weeks while you grow your hair out. Contrary to the myth, cuts don’t make hair grow faster, but they do combat split ends. “If you don’t get rid of them, they just keep splitting,” Valter says. And by progressively chewing up your ends, they slow the net growth of healthy new hair.